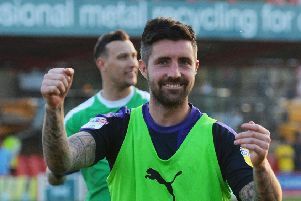 The healthy competition to be Luton’s leading scorer this season can only benefit the club achieve their goal of promotion, according to the pair involved. Both James Collins and Danny Hylton were on target during the club’s crucial 2-0 win over Barnet on Saturday, as Collins made it 19 for the season in all competitions, with Hylton notching his 18th. It’s a good competition, a healthy competition, we’re friends and we push each other every day in training, along with the other forwards. The duo are virtually neck and neck in the race to win the golden boot, but the rivalry is all good natured as Collins said: “We have a laugh about it every day, but there’s no bitterness in it, nothing like that all. “For any team to have two strikers that want to score goals as much as me and Dan, it’s a positive for any side and such a healthy competition. “We’re really good friends off the pitch and always competing together. “We love playing with each other, so it’s really good news for the football club. Strike partner Hylton was also of the same opinion that if both are scoring, it means the Hatters will achieve a top three berth this term. He said: “We’ve been asked the question quite a lot and I say it’s not about me or James Collins, it’s about the 25 man squad we have and a group of players setting out to achieve and to win the league, that’s what we want to do. “We help each other every single day, along with the other forwards as well, and it’s normally the others that try to get in our heads a little bit. “If Collo scores, they’ll say, ‘Collo has gone ahead of you,’ or if I score, ‘Hylts has gone ahead of you,’ and they try and make it a little bit awkward. “It never does, because we both know if we can both get over 20 goals it will be great. “It’s a good competition, a healthy competition, we’re friends and we push each other every day in training, along with the other forwards. Hylton did admit though that with both having the desire to ultimately finish as the leading marksman it can only aid the Hatters, as he continued: “There’s normally a runaway leader like there is in most clubs now, but to have two so close to 20 is great. “Credit to Collo, he’s a great goalscorer, it’s good competition, it keeps pushing us and maybe the reason why we both want to finish top goalscorer. Even if Collins does have to play second fiddle to Hylton eventually, it will still be a new high for him if he can score four more times. He said: “Last year was my best with 22, so I’m on my way to beating that this year. “If I can beat that, I’ll be a happy man. On the summer signing’s impact since arriving from Crawley, Hylton added: “Collo is a goalscorer, he gets to 20 goals every season, so he’ll get more than that this season. “Whoever plays will lead the line well, help the team and they’re more than capable of scoring goals.